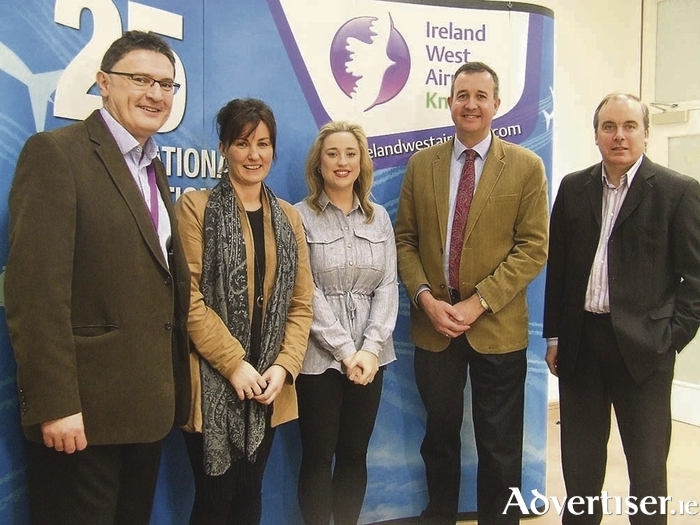 Pictured at the announcement of the charities of the year programme for 2016 at Ireland West Airport were (left to right), Joe Gilmore (managing director, Ireland West Airport), Donna Burke (Pieta House), Rachael Dooley (Cancer Care West), Tom McEvoy (Pieta House), and Mike Crowe (MS Ireland). Ireland West Airport staff have voted to select three new charities for the inaugural Ireland West Airport Charity of The Year programme for 2016. The airport has announced that the three charities selected for 2016 are Cancer Care West, MS Ireland, and Pieta House. A number of events will take place during the course of the year which will engage passengers and staff with the aim of raising as much money as possible for the three charities. Details of these events will be announced in the coming weeks and published on the website www.irelandwestairport.com and on social media channels. Welcoming this initiative, Joe Gilmore, managing director, Ireland West Airport, said: "The airport has been closely involved for many years with a number of community projects and charitable causes across the region and we are delighted to be partnering with three fantastic charities for the inaugural charity of the year programme for 2016. The fantastic work that these charities all undertake really does make such a difference to the people that they support in our community. This initiative is part of the on-going support and social responsibility activities that help the airport build bridges with the local community and we look forward to a successful year of fundraising with the three charities across a range of exciting events in 2016." Mike Crowe, fundraising executive, MS Ireland, welcoming the initiative said: "MS Ireland is delighted to have been chosen as one of Ireland West Airport’s nominated charities for 2016. All funds raised will go towards the continued provision of services in the west. At a time where we continue to experience serious challenges and remain under constant pressure to provide the necessary services, this is a much welcome boost to people who rely on MS Ireland." Richard Flaherty, chief executive officer, Cancer Care West, said: "As a west of Ireland charity, we are delighted to partner with Ireland West Airport and be part of their nominated charities programme for 2016, which will help raise much needed funds for cancer patients and their families all over the west of Ireland." Donna Burke, fundraising co-ordinator, Pieta House, said: "We’re delighted and honoured to be chosen as one of the three very worthy causes that will benefit from Ireland West Airport’s fundraising activities in 2016. Like Ireland West Airport we’re also celebrating a significant birthday this year - 10 years - with our centre in Tuam serving the needs of those struggling in the shadows in the west of Ireland for just over two years. We look forward to working with the airport in the year ahead." Page generated in 0.1589 seconds.